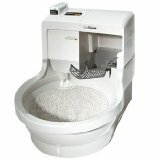 CatGenie Review – Find the best automatic litter box here! Have you ever wished your cat would just learn how to use the toilet? Then the CatGenie self-washing, self-flushing litter box is for you! The CatGenie is a very unique automatic litter box. It requires a connection to an electrical outlet, plus a hookup to a cold water source. When your cat goes to the restroom, the box automatically flushes and disposes of waste, just like a real toilet. You can connect the CatGenie to your toilet or washer hookup. If you opt for the toilet, your cat’s waste will drain into the toilet bowl, and all you need to do is flush to get rid of it. If you connect the box to the washer hookup, then waste will be disposed of automatically via the washer drain. Because of this, the CatGenie is one of the most sanitary litter boxes around right now. What are CatGenie granules made of? The CatGenie doesn’t work with standard litter. Instead, you’ll fill it with washable granules that mimic the look and feel of real litter. This is helpful if your cat tends to hate trying new litter types. The granules are made mostly of recycled plastic. They have a smooth coat, so even if your cat tries to eat them, they will pass safely through her system without a problem. This box supports up to four cats, and it’s most effective for pets over 6 months of age. It offers different cleaning cycles based on the number of cats using it. For example, if you’ve got two cats, the box is active and will flush when used for 14 hours straight, then it sleeps without cycling for 10 hours. This is useful if you don’t want to hear the box cycling at night. You can set a time for the On and Off cycles, too, so the CatGenie will suit your schedule. The CatGenie does require proprietary SaniSolution cartridges for cleaning. Each cartridge is good for between 120 and 240 washes, depending on the settings you’ve chosen. The cartridges are recyclable and biodegradable, so tha t’s a nice plus if you like to protect the environment. You don’t need any special tools to set up the CatGenie; just a pair of pliers and a wrench will do. Instructions are easy to follow even if you’re not familiar with tools or plumbing. One caveat is that if you’ve got a rigid water line in the bathroom, you might need to switch it out for a flexible line. The maker of this product, PetNovations, offers a two-year warranty if something goes wrong. If you need a repair, PetNovations even pays for return shipping to and from their location. If your cat has loose, watery stools, this might not be the best product for you. 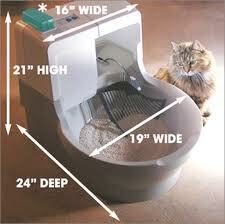 Loose stools can get spread around the litter bowl, and the CatGenie may not be able to clean them up properly. The CatGenie contains a heating element to aid in drying the machine after a clean. Some users reported that if stool falls on the heating element, the odor can be bad. The cost of the plastic litter granules and filters can add up to more than you’d like to pay. Click here to learn more or buy the CatGenie on Amazon. Click on the video below to watch the CatGenie in action. You’ll also see how to set it up.